Sometimes a photo is like the last bus home — you know it’s coming, but you just don’t know when, and, if you’re late you miss it. This dawn view of San Francisco from the Sausalito shore is one of those images. The picture is always there. The city doesn’t move, the old pilings remain stuck in the bay mud — all you have to do is show up at the right time, be patient and then put your trust in your eye and your technology. Simple, eh? Yep, but still not so easy. I visited this popular vantage point on the Marin shore a half dozen times before I made this shot last year right about this time. The scene is best in fall and winter, when the chances of morning fog are lowest and the incoming rains clear the skies overnight. Shaky piers, tripods, and passing runners don’t mix. Gloves are better than coffee to warm the hands. A $10 flashlight makes it easier to operate a $5,000 camera. The sun never oversleeps. I often do. Always take the picture. 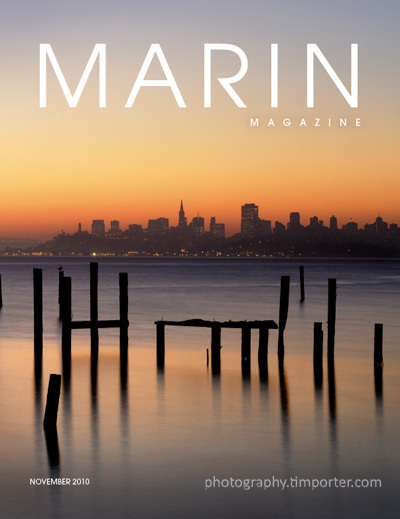 Even if you’re not sure what’s going to happen with it, someone else may have an idea about it some other day — in this case Marin Magazine for its November cover. Want to have this photo on your wall? Of course you do. Visit my gallery on The Marin Store. 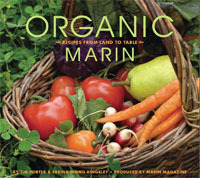 This entry was posted in On the Job, Personal and tagged Marin Magazine, San Francisco, Sausalito.